Jack Cooper was born at Jubilee, son of coal miner, Edwin Cooper and his wife Bertha. Jack had aspirations to join the Navy, but just as he left school, his dad died, so instead Jack had to go down the pit and earn some money to help out at home. Jack says pit life was ‘kind’ to him, the pay was good so he could always fill up his shopping bags and buy a car and a house. Pit training commenced at age 16 with health and safety training and surface work. On the day before your 18th birthday your gaffer would come over and say, “Tomorrow you’re on the face, lad.” Jack worked at several local collieries, Pye Hill, Bentinck and Annesley, but he liked Cotes Park best, he says it was the smallest pit in the area. Jacks often recalls the day when his boot strap jammed in the haulage chain and he struggled to free it, whilst the machine got closer and closer. He pulled and managed to eventually get it free, but if he hadn’t it would have been ‘curtains’ for him! Jack is joined by two pals, ex- colliers, Pete and Mick Robinson. 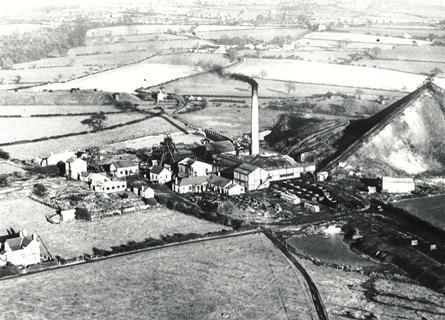 Photo: James Oakes & Co Colliery at Cotes Park, Somercotes.